On April 25, the Commonwealth Conversations Tour made a stop at the Massachusetts Academy of Math and Science so state legislators could get a glimpse into the student projects at the school and have the opportunity to hear about the academic endeavors and the future plans of the students behind the award-winning work. The Commonwealth Conversations Tour began two years ago as a way for state senators to learn more about issues in their own districts and in the districts of their colleagues. Through events like the ones at Mass Academy, Town Hall Forums, and community stops, the tours offer opportunities to meet with residents, leaders in business, and community groups. After the Mass Academy tour, a MassMoves Transportation Forum, hosted by the Barr Foundation, took place at Gateway Park. The WPI stops were part of a daylong program that included an end-of-day Town Hall forum with local residents in Worcester. The stop at Mass Academy showed exactly what kind of educational opportunities funding into the public school of excellence provides. 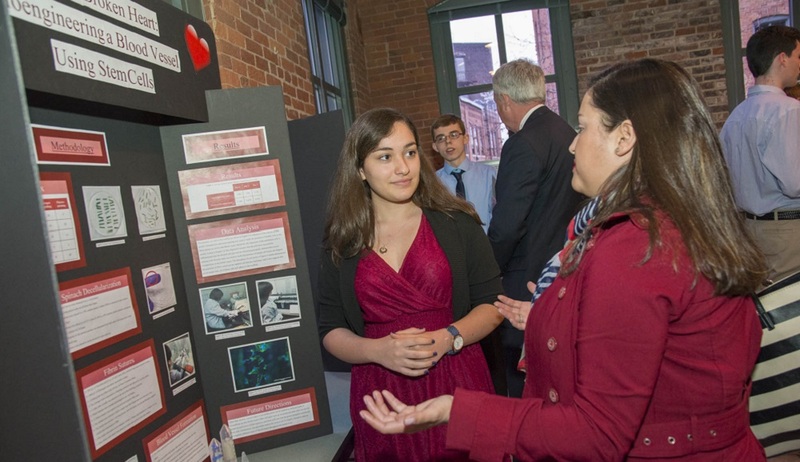 Students, who hail from 65 cities and towns in the state, showcased their STEM fair projects so the legislators could see exactly the caliber of work the students at Mass Academy are producing. And what they are working on has little resemblance to a typical science fair. Projects ranged from concussion prevention devices to improving the Newton Square roundabout to preventing animals from being hit by cars using sensors and bioacoustics. more about student Daya Sharon's project. After hearing about a Boy Scout carelessly waving a loaded 12-gauge shotgun in range of a friend of his, Sam Pendergast of Berlin was inspired to create his project, “Firearm Safety: An Automatic Trigger Lock.” His efforts, which he has a provisional patent on and created with the 3-D printer equipment at Mass Academy, led him to create a lock with an infrared sensor, microcontrollers, a battery pack, and a relay board. “I never would have done this at my old school,” he says. The tour was hosted by state senators Harriette Chandler, Anne Gobi, Jen Flanagan, Ryan Fattman, and Michael Moore, and many guests came in support of a school that received some initial opposition at its inception 25 years ago. And while the academic rigor at Mass Academy is expected, the community makes it a place where the students thrive. “This is a culture where it’s okay to be smart—it’s prized,” says Chandler. “It’s okay to be ahead of the curve here.” After chatting with students, Chandler remarked on her hopes for their trajectories after they have received advanced degrees. “These are our future leaders,” she says. She hopes they can remain in Massachusetts with their innovative products and ideas, and bring their companies to Worcester to continue developing the city’s economy. Barney recalled a parent who said before coming to Mass Academy, "her daughter never talked about her school day. After starting here, her daughter’s enthusiasm for what she was learning made for conversations at the dinner table that expanded to include what she was learning, what she was doing, and all that was going on.